Late last night as many had their eyes glued to screens cheering on the Patriots in the Superbowl, a small crew of pals got busy taking on one symbol of so-called Canada’s nationalism: the RCMP. Within just minutes a handful of determined folks had destroyed all electronic keypad entries to the building, filled the manual locks with superglue and toothpicks, and dismantled the entry and exit systems to their gated police vehicle lot. Along the west windows we left what we came to say: “RCMP OFF WET’SUWET’EN LAND”. It has been 21 days since the violent invasion of RCMP into unceded Wet’suewet’en territory, but the armed siege has not ended. This action was intended to bring the battle a little closer to home, so we targeted the Stoney Creek detachment. It’s easy to de-prioritize the many struggles taking place across continents, but it’s always worthwhile to trace the roots of broader struggles closer to home. The RCMP continue to enforce a court order that has no legitimate standing, allowing TransCanada and Coastal GasLink to begin pre-construction for a 670km pipeline through unsurrendered homelands and a healing centre. While the initial spectacle begins to fade urgency remains; people are being removed and kept from their homes at gunpoint, traditional traplines are being destroyed, medicine and berry gathering areas bulldozed, and the pristine land and waters are becoming contaminated with diesel. The RCMP are doing their job as per usual, protecting state and capital. By having the audacity to set up a temporary detachment and checkpoint, they are only further criminalizing those trying to live on and protect their own territories. Things cannot go on like this: let this action serve as a reminder of the importance of taking action – no matter how small – in the face of colonial capitalist exploitation. The Wet’suwet’en being forced to open their gates to industry under threat from the state was not consent, it is merely an opportunity for allies and accomplices to take action. Get your friends together, stay up all night scheming, and even when you’re tired GET EVEN! Dear Hamilton, have I told you “I love you” lately? <3 You guys fkg rock. Thank you for standing up and standing strong and standing brave and true to justice. Where is this RCMPig outpost located, if I may ask..? 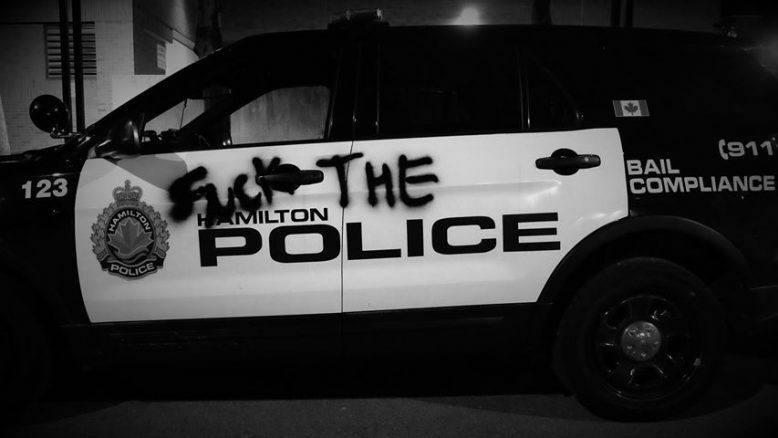 One thing is for certain concerning anarchist (and other) direct action, directed against NATO Pigs and other agents of ‘our’ oligarchic Neoliberal capitalist masters: that the so-called local ‘leadership’ of the working-class — here in Hamilton, represented by the likes of the ‘Hamilton & District Labour Council’, the OFL ‘Ontario Federation of Labour’, AND most all of the local trade union Apparatus, et al. — WILL invariably side with the ruling-class ‘Forces of Order’ and Private Property [over the public, social means of production], against ANY expression of actual working-class power. The Labor Aristocracy long ago chose to side with their bourgeois overlords against Proletarian Democracy. ‘The Spec’ OTOH needs competition — and could easily be put out of business by a daily workers’ paper AFAIC, considering how truly awful, incompetent and reactionary they are.